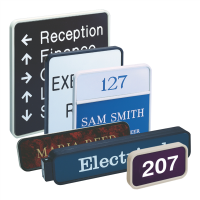 ​Create a professional office with our custom desk and wall signs. Interior Office signs, ADA compliance signs create the proper atmosphere for way finding around the work place. We make it simple and affordable to be in compliance with ADA Braille signs or simple signs. Let us design the proper signage for your facility and office space. Call on the experts when you need fast signs now for your work place or office. Call 281-364-7100, we will be glad to assist you with all your needs.